Finally, the rain stopped and we had a very pleasant day at Sherborne Castle in Dorset. The event proved to be very popular with the entrants and the public, causing a considerable tailback at the entrance for a while. It was gratifying to have the space to be able to fly both flags – our original Gloucester and South sail flag and the more recent club banner. Ann and Mike Chandler's Integrale Evo, David Roots Giulia Special and Richard and Jenn Williams' Fulvia S1 in rally spec. 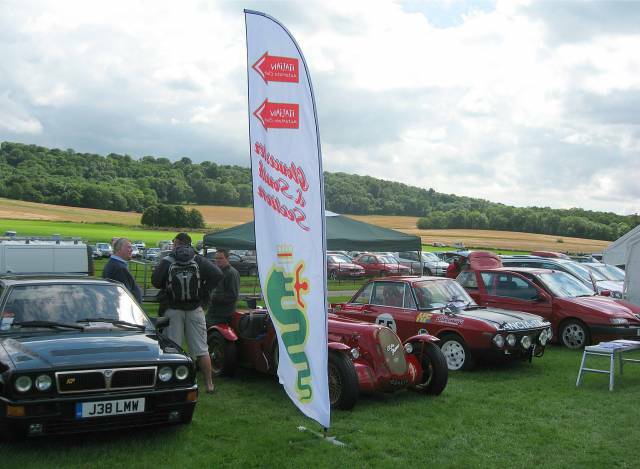 drew considerable attention to our display, not to mention all our other cars of course! Many thanks to Nigel and Sue Bailey for use of their garden gazebo as our Rest and Recreation area. 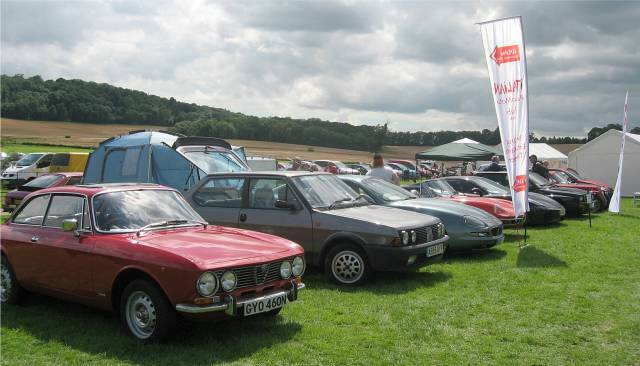 Commiserations must go to Jeremy Dutton, who had problems with three of his four Alfas on the day. His Bertone dumped its clutch fluid just as he was leaving home in the morning so he came to Sherborne in his Duetto Spider, only to find on arrival that it had lost most of its coolant along the way. On returning home his 156 spewed diesel all along the A46, so every journey is an adventure with an Alfa Romeo!